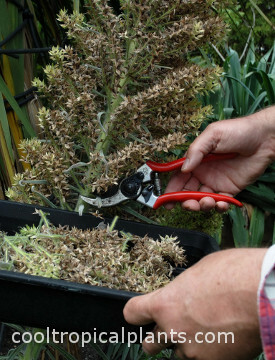 Echium wildpretii seeds need about one month to ripen after flowering finishes. You will know exactly when the seeds are ripe as the gentlest of vibrations (the wing beat of a butterfly in the neighbours garden for example) dislodges the seeds and sends them cascading towards the ground. 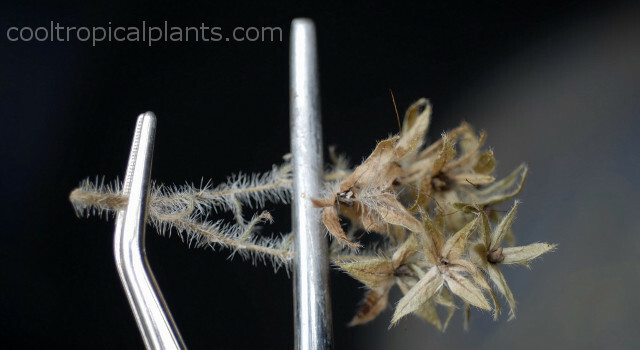 In order to outwit the plants seed-shedding process, it was decided to snip off the flower stalks when the seeds were clearly ripe but still attached. 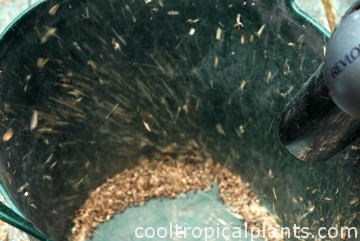 The idea being that the seeds would fall off into a container when ready. 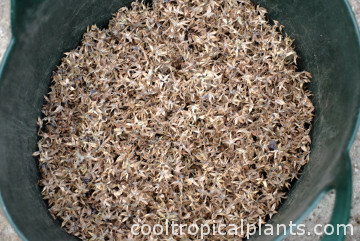 The removed stalk/seeds were stored in a large tub in greenhouse for the next 6 weeks to dry. 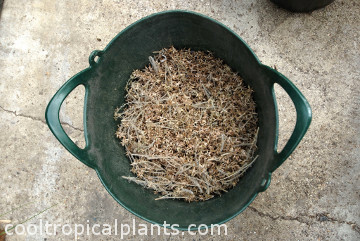 Once thoroughly dry, the plan was to agitate the stalks a bit and be left with a nice clean sea of seeds below. It just so happened that the plants were not outwitted in the slightest by this strategy. Once the stalks were removed, the seeds clung on to their stalks with the tenacity of a superglue (extra strong) adhesive. 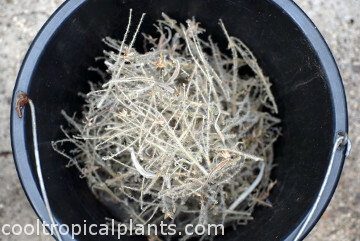 Not only were the Echium wildpretii seeds welded to the stalks, the stalks were covered in tiny little hairs. These little hairs were determined to penetrate any exposed skin, hair, clothing, you name it. After manually prizing off the first dozen or so seeds with two sets of large tweeezers, boredom soon set in. The next step involved striping the seed heads from the stalks. By holding the stalk with one pair of tweezers, the other pair of tweezers pulled off the seed heads. The seeds remained firmly attached all the same. Various methods were tried to persuade the seeds to loosen their grip. 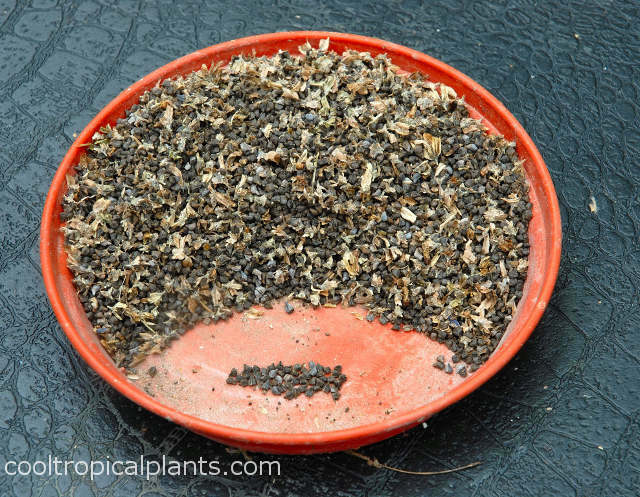 The least unsuccessful method turned out to be forcing the seed heads through a garden seive. Ultimately this did result in a tub of seeds and plant debris which needed to be separated, wheat from chaff style. The tool chosen for this task was the hair dryer. Although this was extremely successful at separating the seeds from the remaining debris, it was also very successful at transfering the aforementioned tiny hairs into the authors nasal passages. The consequences of which were not felt for a few days but became unpleasant and persistent. So should anyone attempt to replicate this process it is strongly advised to wear eye protectors and a good quality dust mask. You have been warned. At the end of the (long) day a substantial amount of seeds were collected. The small pile at the front contains 50 Echium wildpretii seeds. Lay a sheet, spread out around the base of your plant. Gather the fallen seeds from the sheeting. But I guess that would have made for a boring read. 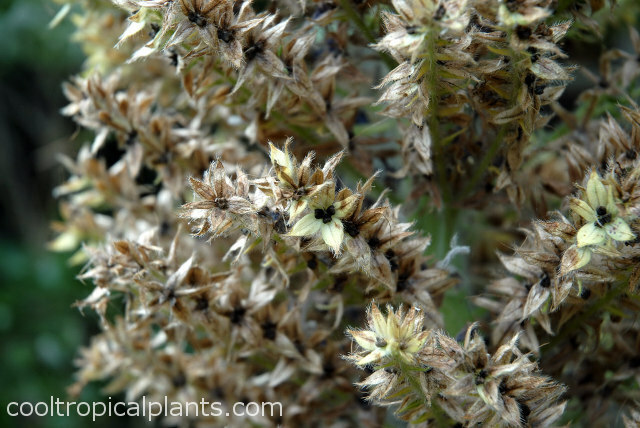 One advantage of the ealy flowering and seed setting of Echium wildpretii is that you are able to sow seeds in autumn (fall) ready for next spring. The plants remain small and don't take up too much greenhouse space. Prick out the seedlings in the spring and you will have a healthy head start on the season.